The Fab 'n' Funky #35 Challenge is to use your favorite colors. When I saw this challenge (though it's almost too late) I just had to submit this card. 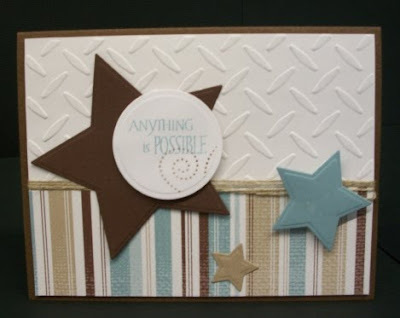 My favorite colors when it comes to making a card are blue with brown along with some texture of some kind. 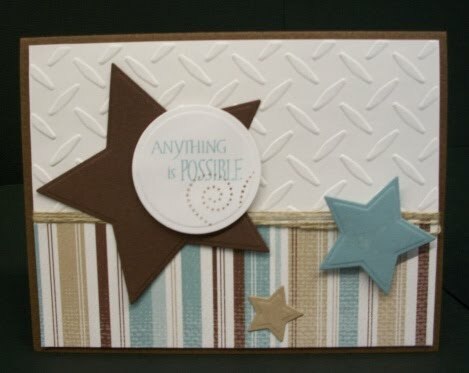 The Fasionista Friday #43 Challenge is to use diecuts. As you will see, this fits perfectly into that challenge. I made this for my grandson's birthday. I tend to grab those stars to do things for the men in my family for ANY reason. They are great for male cards. Hope you like it. Robbie, this is so cute. You are such a talented card maker!